Growers who play their cards right will be able to work together, and coordinate the efforts of packhouses and resellers of grade fruit consistently, and achieve a better return than if more fruit is automatically downgraded, Mr Filippi says. “There will be a slight shift in specifications, and a coordinated marketing effort to explain why the fruit looks the way it does when it hits the shelves. 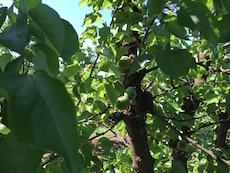 It could be a real boost for grower return if the consumer understands why they’re getting slightly blemished or odd shaped fruit.” Repeat sales are what will help growers, Mr Filippi adds, rather than trying to charge too high a price to consumers. Around 40 people, at least 25 of whom were growers, were present at last night’s meeting to discuss the impact of a hailstorm on the Shepparton and Goulburn Valley region. The meeting group also heard a presentation from an academic at Monash University about how to spot weather patterns form radar images, to give growers the best chance to prepare for future hail events.